Earth's Internet & Natural Networking: Earth's Internet: the Original World-Wide-Web! Earth's Internet: the Original World-Wide-Web! I really like this colourful animated illustration of outer-spacy Alien looking mushrooms in among other plant life in the background. It gives the impression of something ET Prehistoric yet at the same time intelligent. Clearly, when we look at the natural world we should indeed view it from a brilliantly constructed design with loads of purpose and intent. Viewing it as nothing more than un-purposed bundle of mistakes and compromises is what has plunged our natural world into the present degraded state we now find it in. In the case of mycorrhizal Fungi, it is indeed a brilliantly constructed network which is very similar to any sophisticated complex Human invented Internet Network or Communications Grid, yet tens of thousands of times more complex and sophisticated than any human created technological endeavor. Take a close look at the picture below which shows actual mycorrhizal connections of fungal mycelia not only forming a grid networked pattern from the center pine seedling's taproot, but also connecting the two other pines within the same grid network in the process. What an incredible brilliantly complex piece of engineering. Industrial Science shows blatant disregard for such wonderful natural processes, despite the propaganda to the contrary. When I first viewed this picture several years ago, it was from the website of a company called Plant Health Care Inc, one of the first to commercially produce inoculents for usage in Agriculture, Gardening and Landscaping industries and of course Environmental Restoration of degraded sites cause by human ignorance and stupidity. This particular fungi referenced in the photo is Pisolithus tinctorius. When colonized on the pine or oak roots, it has been shown to increase water and nutrient absorption by more than 200%. Clearly in the photograph you can see this illustrated with your very own eyes. Once again what I want to attempt with this blog is to illustrate to the average plant enthusiast just how brilliantly things in the natural world operate and how anyone can replicate these constructs and create a garden or landscape environment that is totally independent of any of the popular marketed "Science-Based Technologies" (that would be as opposed to already effective Nature Based technologies) which involve and in many cases the required usage of any and all chemical fertilizers and pesticides manufactured by this world's huge Corporate Giants bent on keeping the status-quo. 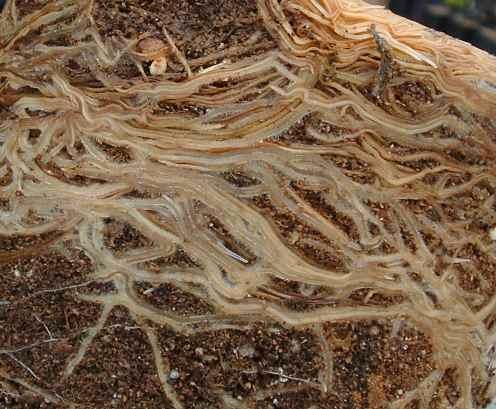 There are a few questions that relate directly to the plant's roots to support the soil community. On most sites there is at least as much going on under the ground as above it, and usually this is more important. Hopefully I can address some of the basic fundamentals before moving onto more technical aspects of the "Earth Internet". Hopefully my goal of helping young people appreciate networks of a natural kind will be realized. There's more to Networks than I-Pads, Smart Phones, etc. Gotta love the "Earth's Internet" LOL! Of special note here are the content of this site and any photos I may share here. When I post or publish something here, I'm sharing things with the public. It therefore becomes yours. Feel free to use the info, share it or even improve upon it. I understand the world we live in is a jealous one, suspicious and motivated by selfishness and greed. To that end many are obsessed with credits, copyrights, patents and whatever wealth or fame obsessed endeavor the common human immerses themselves into. In general that describes political, religious, scientific and big Corporate leadership on this planet. I could care less about any of these. My goal is to help or point folks anywhere in the right direction and if content of this blog helps and you can personally benefit or profit in the process then more power to you. I just ask you be responsible and not follow the horrible example of this world's leadership. In future posts I'll address a few questions and the answers to these as far as my personal experience. I'll relate my own mistakes as well as my successes. In the mean time please enjoy the blog. "How I First Became Addicted To The Internet"